Remember last week on my running shoe style post I said that if you want to wear white sneakers then they better be a pair a Adidas Originals or Stan Smith’s (YSL And Nike also have some great pairs). Well here I am showing you one way to pull off the white sneaker and suit look this spring and summer. It’s actually quite easy because white sneakers go with just about anything but if you want to wear it with a blue suit then this is my favorite way to do it. A light blue shirt and a dark blue tie is really all you need to dress down your navy suit on the weekend. 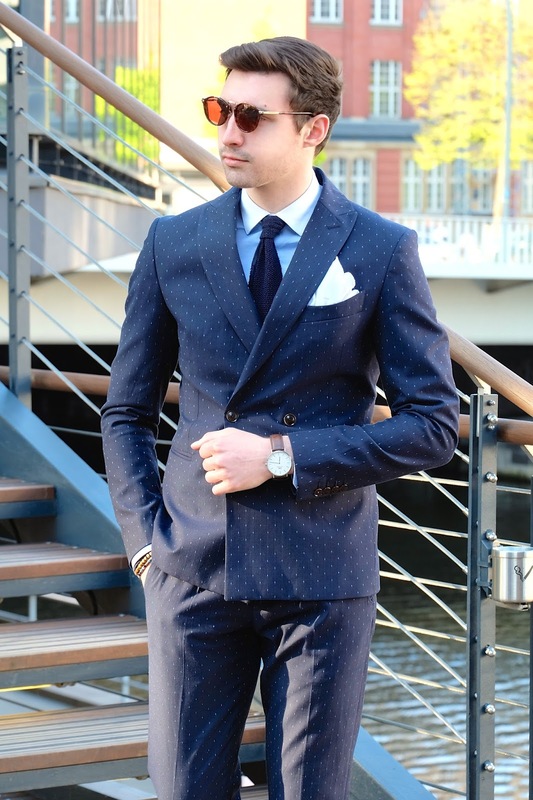 For a little bit of a more relaxed look go for a printed suit such as mine instead of your usual business version. Wear a double breasted for extra style points and finish off with a few accessories. You've probably already seen looks similar to this but if you haven't then i'd love to know if it's something you'd wear. Thanks for reading. Really like the shirt and suit combination.